Innocent Bystanders is a 1972 spy thriller directed by Peter Collinson that was filmed in Spain and Turkey. 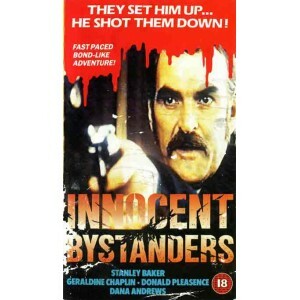 It stars Stanley Baker and Geraldine Chaplin. The screenplay was written by James Mitchell based on his 1969 novel of the same name. Stars Stanley Baker (Sands of the Kalahari) as John Craig, a James Bond like British secret agent who's given one last chance to redeem himself after a failed mission. Loomis (Donald Pleasence), the head of the organizations no longer trusts Craig, so he sends two younger and more ruthless agents to intercept the Russian scientist Craig has been sent to locate. Accompanied by Israeli spy Miriam Loman (Geraldine Chaplin), Craig must decide if the scientist is to be rescued or eliminated. The level of violence and bloodshed in Innocent Bystanders is such that at times it makes the James Bond films look like models of decorum. The stellar cast includes Dana Andrews as Blake, the CIA boss, Sue Lloyd and Derren Nesbitt as Craig rivals, Joanna Benson and Andrew Royce. Stylishly directed by Peter Collinson (The Italian Job).